As Passover nears, it’s time to take stock of the wonderful things President Trump has done, each of which, on its own, should please conservatives. Dayenu! A missile taking off for Syria. Passover is around the corner and I have an ear worm: The Passover song Dayenu. The Hebrew word “Dayenu” (דַּיֵּנוּ) means “it would have been enough,” or “it would have sufficed.” The pattern of the song is to list the miracles God performed for the Jewish people, with the chorus being “Dayenu” — it would have been enough. — Dayenu, it would have sufficed! You can read more here about the song, including the miracles it recites, with each miracle being sufficient unto itself, without the necessity of anything more. If you were to see my calendar, you’d see that I have a notation on it for Sunday: “Write Dayenu post about Trump.” As written, my words can be taken as blasphemous (am I calling Trump a God or even the God?) or tremendously insulting (will I say he’s the new Pharaoh?). 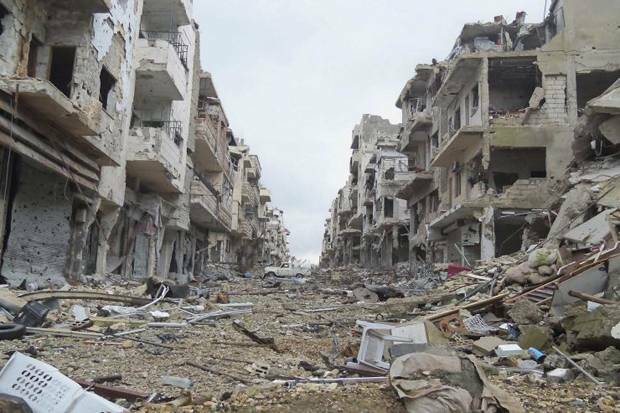 What the Syrians have done to themselves and each other. I’ve had the weekend to ponder the wisdom of Israel’s attack against Syria and I’ve concluded that she definitely made the right decision. I’ll set out my reasons below, but I’d love it if you’d chime in with challenges, further thoughts, etc. 1. In a day and age of “weapons of mass destruction,” the intended target can’t wait until the weapons are launched to declare war. The weapons’ very existence in the hands of an enemy is, in and of itself, a declaration of war. Once Israel knew with reasonable certainty that Syria had chemical weapons and long-range missiles, Israel had to act. I therefore believe the strike was both reasonable and necessary. The Israeli people agree, and are very supportive. 2. Having destroyed Syria’s “easy to launch” weapons, Israel has little to worry about. She is moving her defenses up to the Golan Heights, which is a smart thing to do, but the fact is that, denied “push-of-a-button” weapons such chemicals or missiles, Assad doesn’t have anything with which to wage war against Israel. He would certainly have struck against Israel if it was easy, both out of malice and to try to draw people in Syria to his side in the raging civil war. Now that easy is out, he doesn’t have the troops or resources to abandon the fight against his own people and begin a war against Israel. As it is, large parts of Syria’s infrastructure have already been destroyed. This would be even more stupid than Hitler’s decision to attack Russia. 3. Israel gave Obama a very big gift. Obama made a terrible, amateur mistake when, during an ad lib, he essentially promised that, if Assad used chemical weapons, America would go to war against him. Now that Assad has been shown to have used chemical weapons against his own people, Obama was in a terrible spot. Israel by smacking around Syria’s chemical and missile arsenal has also pulled Obama’s chestnuts out of the fire. He won’t be grateful — his kind never is — but it was a gift nevertheless. And that’s what I think. What do you think?